Your flight of Kenya Airways departs from Mumbai at 0635 hours and reaches Nairobi at 1010 hours. Then you will be transferred to Nairobi city for lunch. After lunch visit Nairobi Museum and proceed to Safari Park Hotel. Dinner and dance show at Safari Park Hotel. After breakfast drive back to Aberdare Country Club to collect your baggage. Then start your journey for Lake Nakuru. En-route you will visit Thomson fall and reach by lunch time. 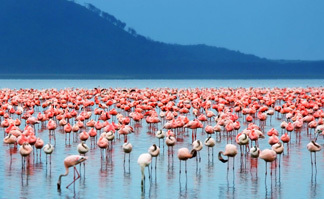 Lake Nakuru itself boasts the most spectacular of all of Africa’s bird sights – enormous flocks of pastel pink flamingoes, as well as other bird species. Airfare, Govt. taxes, Visa charges, exchange rate, Airport taxes & Air schedule are subject to change by the relevant authorities. Any extra cost incurred due to flight change, rescheduling or cancellations has to be borne by the participant. 1) Mumbai International Airport, Medical Centre, Near Airport Ambassador Hotel, Mumbai.